Santa Barbara Garden Conference Suites welcomes you to one of our most beautiful conference suite locations -- Santa Barbara, California -- a great place to visit as well as have a deposition! Located off of scenic Highway 101, between San Francisco & Los Angeles, this TO&A Santa Barbara site is situated at the Inn of the Spanish Garden, and features three handsomely furnished conference/deposition rooms. The elegant Boardroom has seating for 12 and features state-of-the-art audiovideo capabilities. Complimentary coffee, tea and water are provided. Our TO&A litigation staff will be on hand to provide for all your court reporting needs. The Inn of the Spanish Garden is just blocks from Santa Barbara’s finest dining, shopping and entertainment. 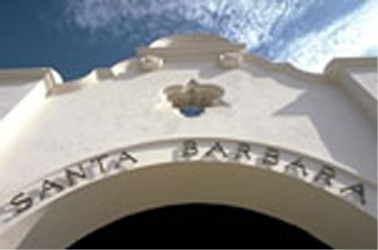 Its an easy walk to a number of theaters, the Museum of Art, the Karpeles Manuscript Library, and the beautiful Courthouse with it’s Sunken Gardens -- all nestled in the heart of Santa Barbara’s downtown Historic Presidio District.